Since its launch in 2011, Southern Innovator magazine has proven to be a groundbreaking publication, both capturing a global innovator culture and its leading pioneers and innovators, and influencing a greater awareness of the power of innovation to transform lives and end poverty. Issues 4 and 5 were launched towards the end of 2013 and at the beginning of 2014. 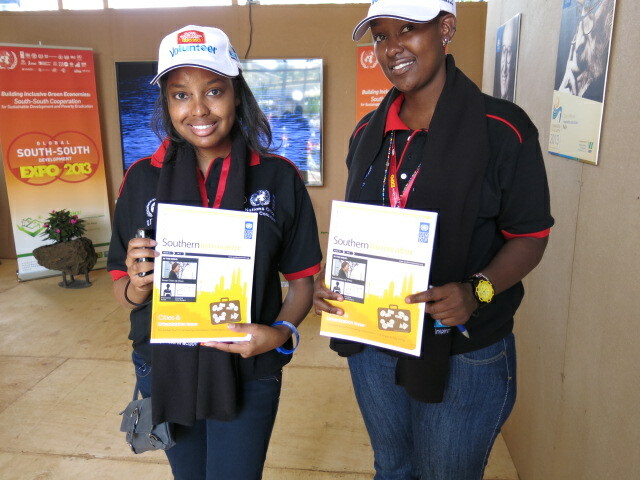 Issue 4 saw its debut at the Global South-South Development Expo held in November 2013 at the headquarters of the UN’s Environment Programme (UNEP) in Nairobi, Kenya (below). 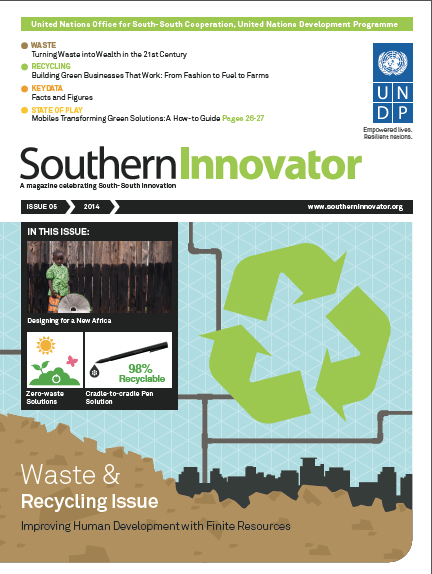 The magazine’s fifth issue, on the theme of waste and recycling, signals a milestone for Southern Innovator. Launched as a pilot publication in 2011, reader enthusiasm has ensured support from UNDP for each subsequent issue of Southern Innovator thereafter. Its content and design have been refined based on reader feedback and the keen creative eyes of the design team in Reykjavik, Iceland. Southern Innovator, and its sister publication, e-newsletter Development Challenges, South-South Solutions, have reached a crossroads: in order to reach the scale required to amplify the magazine’s impact, a steady budget is needed. The team behind the magazine are currently developing plans for a significant scale-up of the magazine and are also seeking funding support to help. The magazine also requires a central hub and a network of bureaus to handle the day-to-day running of the magazine. With its high profile, this presents a great opportunity for a university/research institute/innovation hub or international agency to join with Southern Innovator. It is one thing to discuss the role of innovation in the abstract. It is another to see it applied in some of the harshest environments on the planet and in some of the most severe country conditions. But this is what underpins the content of the magazine: hard-earned experience over two decades working in international development while drawing on a vast network of global innovators. The magazine offers practical solutions grounded in the world of the 21st century. A place that, while turbulent and resource-stressed, is also a place where instant communications has never been easier or more accessible to the world’s poor. So, the only question that remains is: who will help us to reach the next level?